Northern Rough-winged Swallow observed on Valentine's Day, Feb. 2010, near the Agua Fria River in Glendale, Arizona, USA. Swallows as a group are easily recognized as they swoop and swerve on long agile wings as they capture flying insects on the wing. Infrequently they rest on a tree branch or utility wire to allow careful viewing by nature watchers. 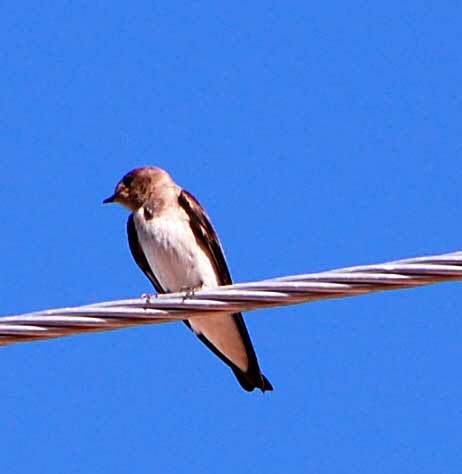 Experienced bird watchers learn to pick out a flying bird and follow it long enough to catch the important traits of the several swallow species likely to be encountered in the Sonoran Desert. Season is a helpful clue to identification. During the hot summer months Cliff Swallows are far and away the most abundant swallow in the desert. In contrast, during the winter months, the Northern Rough-winged Swallow is the most frequent. Rough-wings have a white chest and belly washed with varying amounts of gray. The head is cast with brown and the wings are noticeably long. The back and wings are nearly uniform brown - watchers must recognize that the color of swallows is heavily dependent on the direction of incident light. Watch the bird long enough to get several different light angles. Copyright Michael J. Plagens, page created 15 Feb. 2010.